An Escrow Account (also known as a mortgage impound account) is a separate savings account that is exclusively for real estate taxes and homeowners’ insurance premiums. It is managed by the lender and its main function is to protect the lender from any property tax and homeowners insurance payments that the homeowner cannot make. What is an Escrow Account for? An Escrow Account is specifically used to pay for a portion of your mortgage payment. When you get a mortgage, you are expected to pay your mortgage in the form of monthly payments. Mortgage payments are mainly comprised of 4 parts, commonly referred to as “PITI” or principal, interest, taxes, and insurance. The principal is the amount of the loan without any interest added to it. The interest is basically a fee to use the loaned money. Taxes are the taxes you pay for your property that benefits the local public schools, fire departments, public library, etc. Property taxes are paid twice a year on November 1st and February 1st and are paid to the county. Insurance is a mandatory requirement in order to protect your most expensive asset, your home, from certain natural disasters, like fires and floods, and is obtained through your insurance agent. Owning a home without homeowners insurance is the same thing as owning a car without car insurance; it is illegal. Since property taxes are due twice a year to be paid to the county and the insurance payments are made to the insurance company, there are actually 3 separate payments in order to pay for the mortgage instead of one monthly mortgage payment. In order to prevent the homeowner from being late on payments, the lender will sometimes add the cost of real estate taxes and the insurance payment amount to the principal and interest to consolidate everything into one simple monthly payment. In order to do this, the homeowner will have to open an escrow account. While it seems beneficial for homeowners to open an escrow account, the real reason why escrow accounts exist is so that the lender is protected in the event that the homeowner doesn’t pay. The lender has to protect themselves because they decided to loan you a large sum of money in order to purchase a home. Since property taxes and homeowners insurance are a large part of homeownership, it is in the lenders best interest to make sure that these get paid on time. An escrow account is great for homeowners because instead of having to manage 3 different payments with 3 drastically different due dates, you now have only one monthly payment to think about. While most accounts that hold money are managed by the person who opened the account, an escrow account is usually managed by the lender. After all, if the whole point of the escrow account was to simplify the mortgage payments and to eliminate the inconvenience of memorizing different due dates, it wouldn’t make any sense to have the homeowner put money aside in an account and give them the responsibility to pay these fees on time. When the homeowner pays their new monthly mortgage payment with the added property tax and insurance premium values, the lender will then take a portion from the mortgage payment and transfer these funds into the escrow account. The lender calculates how much is added to your principal and interest each month by obtaining a copy of your bills from the local property tax office and insurance company. You are not required to provide a copy unless they ask for it. Are There Any Fees With Escrow Accounts? No, there are no fees associated with the maintenance of escrow accounts. Since the concept of the escrow account is so convenient with the lender doing most of the busy work, it wouldn’t be surprising to learn that there is a service fee to pay for the lenders services. The lender actually does not make any direct profit from escrow accounts. 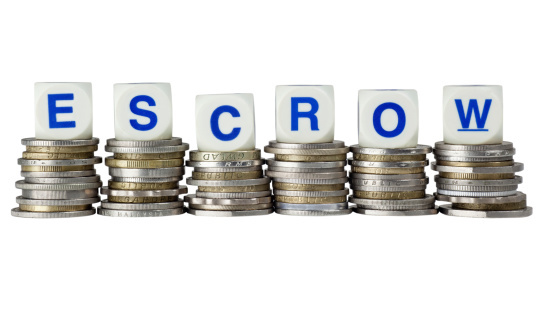 Escrow Accounts are not mandatory for everyone, but they are mandatory depending on the type of loan that is chosen. With a FHA Loan (Federal Housing Administration), a down payment of 20% isn’t required. In fact, a FHA Loan only requires a minimum of 3.5% as a down payment for a mortgage. Because the homeowner is putting less than the desired amount, the homeowner is required to purchase FHA Mortgage Insurance just in case they cannot keep up with their payments. Those who choose to have a FHA Loan are also required to have an escrow account. If you have a VA Loan, which does not require any down payment, an escrow account is not mandatory by The Department of Veteran Affairs, but many lenders make it a requirement that veterans get one. Many lenders will push homeowners to have an escrow account, even charging a fee to waive the account. Not all lenders will charge a fee for this, but if they do, the fee is usually .25% of the loan amount and is paid during closing. If a homeowner wants a FHA Loan and wants to waive escrow, the lender will usually not allow it or require that they make an additional down payment. There are more benefits to an escrow account in addition to the convenience it provides. Having an escrow account ensures that the homeowner is financially equipped to tackle these bills when the time comes for payment. Because homeowners insurance is paid annually and property taxes are paid twice a year with set due dates, it is easy to forget about them especially since they don’t come with an auto-pay option. Putting aside money every month to save up for these is a more responsible decision. Homeowners who do not have an escrow account can easily get sticker shock when seeing 6 months’ worth of property taxes or 12 months’ worth of insurance premiums in one shocking amount. Even though it is a known requirement that property taxes and insurance must be paid, it can be difficult to put aside money each month. There could be other uses for that money, but having it as a part of the monthly mortgage payment makes thinking about saving less difficult. If you end up putting in too much money into your escrow account because your lender overestimated how much you were going to owe in taxes and insurance premiums, you will be reimbursed by the lender if you close your account or if you pay off your loan. If your lender ended up charging you more than what the bill totaled, whatever is leftover will go towards the next payment. Your lender is also required to provide statements so you know how much you have in your account and how much you have contributed to your account. Property taxes and home insurance premiums are not fixed. This means that the homeowner does not pay the same amount every time. This is because property taxes are calculated based on your home’s value, which can fluctuate depending on the market. Like property taxes, homeowners insurance rates are also tied to the market meaning they can also change. Homeowners insurance also offers “inflation guard” as an add-on in order to match your coverage to reflect inflation. This means that your premium will increase every year in order to keep up with the rate of inflation. For those who have chosen to get a fixed rate mortgage, having an escrow account can be frustrating since one of the perks of having a fixed rate mortgage is having the same payment every month. With an escrow account, the fixed rate mortgage payments are no longer “fixed” since the lender adjusts the charged amounts to make sure there will be sufficient funds without blatantly overcharging the homeowner. While the lender is responsible for making sure that insurance premiums and property taxes get paid, they are human and there is room for error. Even if you have an escrow account, you would be the one at fault if you are delinquent on your payments. Escrow accounts are a great resource for anyone who wants to make sure they’re putting aside money every month to pay for their property taxes and homeowners insurance premiums. There is no maintenance fee and your lender does not make a profit off your account. The only person it benefits is the account holder by eliminating additional maintenance of their finances. While escrow accounts can be useful to many, they aren’t preferred by everyone. Some people like to have full control of their finances and are financially responsible enough to remember when these payments are due and budget for them accordingly. If this is something that you know you can do, then an escrow account isn’t necessary. Since life has a tendency to throw hurdles when we least expect it, having an escrow account wouldn’t do any harm since there are no fees associated with it.